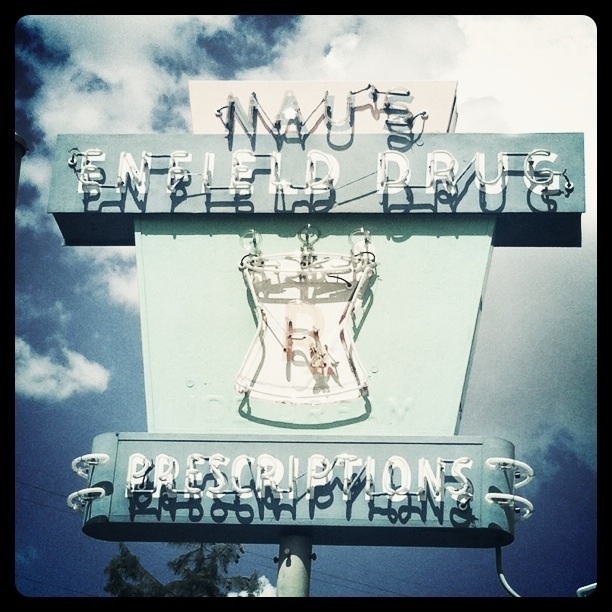 Nau’s Enfield Drug, located in historic Clarkesville, on the corner of 12th and West Lynn, has been serving Austin since 1951. There has been only one change of owners; when the Nau’s sold the pharmacy to now general manager, Laura Labay’s parents in 1971. Nau’s longevity is no mistake with their soda fountain & grill, pharmacy and their stronghold of 1950s customer friendly service. Local TV station YNN just recently featured the Drug store on their segment “Off the Plate.” Here you can see the friendly smiles of the staff, the shelves stocked with nostalgic toys, the original soda fountains (that they still use today) and a glimpse of just how far $5.85 will take you back to yesteryear with a cheeseburger. Sorry, no fries.